Texas Tech currently leads the series 22-21-3. ^ a b c "2010 Football Media Supplement" (PDF). Texas Tech University. p. 81. Retrieved August 6, 2010. ^ Russo D., Ralph (December 17, 2013). "Amaro named to AP All-America team". Lubbock Avalanche-Journal. Retrieved December 17, 2013. ^ a b Johnson, Richard (November 29, 2018). "Official: Matt Wells hired by Texas Tech". SB Nation. Retrieved December 1, 2018. 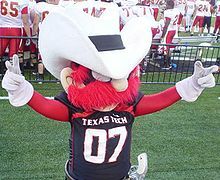 ^ "Texas Tech Football History Database". Retrieved December 31, 2006. ^ "Baylor Yearly Totals". College Football Data Warehouse. Retrieved October 12, 2009. ^ "Colorado Yearly Totals". College Football Data Warehouse. Retrieved October 12, 2009. ^ "Iowa State Yearly Totals". College Football Data Warehouse. Retrieved October 12, 2009. ^ "Kansas Yearly Totals". College Football Data Warehouse. Retrieved October 12, 2009. ^ "Kansas State Yearly Totals". College Football Data Warehouse. Retrieved October 12, 2009. ^ "Oklahoma State Yearly Totals". College Football Data Warehouse. Retrieved October 12, 2009. ^ "Texas Yearly Totals". College Football Data Warehouse. Retrieved October 12, 2009. ^ "All-Time Bowl-Game Record" (PDF). Bowl/All-Star Game Records. National Collegiate Athletic Association. 2010. p. 13. Retrieved December 10, 2010. ^ "Bowl History" (PDF). 2010 Football Media Supplement. Texas Tech University. p. 69. Retrieved December 11, 2010. ^ "All-Time Bowl Appearances Leaders" (PDF). Bowl/All-Star Game Records. National Collegiate Athletic Association. 2010. p. 14. Retrieved December 10, 2010. ^ "2010 Football Media Supplement" (PDF). Texas Tech University. p. 69. Retrieved December 11, 2010. ^ a b "All-Time Bowl-Game Results" (PDF). Bowl/All-Star Game Records. National Collegiate Athletic Association. 2010. p. 7. Retrieved December 10, 2010. ^ "All-Time Bowl-Game Results" (PDF). Bowl/All-Star Game Records. National Collegiate Athletic Association. 2010. pp. 6, 7. Retrieved December 10, 2010. ^ "All-Time Bowl-Game Results" (PDF). Bowl/All-Star Game Records. National Collegiate Athletic Association. 2010. p. 5. Retrieved December 10, 2010. ^ "All-Time Bowl-Game Results" (PDF). Bowl/All-Star Game Records. National Collegiate Athletic Association. 2010. p. 9. Retrieved December 10, 2010. ^ a b c d "Team-by-Team Major Bowl Scores With Coach of Each Bowl Team" (PDF). Bowl/All-Star Game Records. National Collegiate Athletic Association. 2010. p. 27. Retrieved December 10, 2010. ^ "Bowl History" (PDF). 2010 Football Media Supplement. Texas Tech University. pp. 62–66. Retrieved December 11, 2010. ^ a b "Bowl-by-Bowl Attendance" (PDF). Bowl/All-Star Game Records. National Collegiate Athletic Association. pp. 32–38. Retrieved December 11, 2010. ^ "Major Bowl-Game Attendance" (PDF). Bowl/All-Star Game Records. National Collegiate Athletic Association. p. 33. Retrieved December 11, 2010. ^ "College Football Hall of Fame" (PDF). Award Winners and All-Americans. National Collegiate Athletic Association. p. 23. Retrieved December 13, 2010. ^ a b "Heisman Trophy Voting:1935–1975". Rivals.com. Retrieved December 13, 2010. ^ a b "Heisman Trophy Voting:1976–present". Rivals.com. Retrieved December 13, 2010. ^ "National Awards" (PDF). 2010 Football Media Supplement. Texas Tech University. p. 48. Retrieved December 13, 2010. ^ Soliz, Brandon (December 5, 2016). "If Patrick Mahomes declares, where does he rank among big boards?". DallasNews.com. Retrieved December 5, 2016. ^ Reiss, Mike (February 24, 2010). "Mosi Tatupu's cause of death not given". ESPN. Retrieved December 14, 2010. ^ "All-Americans" (PDF). 2010 Football Media Supplement. Texas Tech University. pp. 42, 43. Retrieved December 13, 2010. ^ a b "Consensus All-Americans by College" (PDF). Award Winners and All-Americans. National Collegiate Athletic Association. p. 16. Retrieved December 13, 2010. ^ "All-Time Academic All-America (by schools T-Z)" (PDF). College Sports Information Directors of America. p. 405. Retrieved December 14, 2010. ^ "The 2009 NCAA Division 1 Records (FBS)" (PDF). NCAA. NCAA. Retrieved February 5, 2014. ^ a b c d e f g h i j k l m n o p q r "2015 Football Records Book - FBS" (PDF). Retrieved September 10, 2015. ^ "Jones AT&T Stadium. Delivered". AT&T. 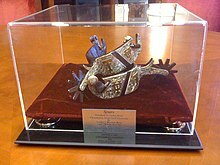 April 6, 2006. Retrieved December 8, 2010. ^ Hooks, Michael Q. (May – June 1983). "From the Fair Grounds to Jones Stadium" (PDF). Texas Techsan. Texas Tech Alumni Association. p. 24. Retrieved December 8, 2010. ^ "Stadium Club view fan-tastic". Lubbock Avalanche-Journal. July 5, 2003. Retrieved December 8, 2010. ^ Butler, Kristina Woods (November 6, 2008). "Cultivating the Home Field Advantage, A Memoir". Texas Tech Today. Texas Tech University. Retrieved December 10, 2010. ^ Jansa, Evan (July 19, 2010). "Renovations to Jones AT&T Stadium set for completion in time for season opener". The Daily Toreador. UWIRE. Retrieved December 10, 2010. ^ Trotter, Jake. "Big 12's best student sections". ESPN. Retrieved February 17, 2014. ^ "It's A Sellout! All Season Tickets for the 2014 Season Are Sold". TexasTech.com. Texas Tech University. Retrieved July 9, 2014. ^ "Texas Tech Yearly Results". College Football Data Warehouse. Retrieved October 15, 2008. ^ "Under Armour, Inc. – Under Armour速 Partners with Texas Tech University to be the Official Outfitter of the University's Football Program". Investor.underarmour.com. March 27, 2006. Retrieved December 4, 2011. ^ Graham, Mike (February 19, 2013). "Kliff Kingsbury's contract gives him oversight in Texas Tech's uniform design". The Dallas Morning-News. Retrieved February 21, 2013. ^ "Texas Tech Football". Masked Raider. Retrieved December 4, 2011. ^ Williams, Don (September 15, 2010). "Red Raiders' use of white helmets elicits range of opinions | Lubbock Online | Lubbock Avalanche-Journal". Lubbock Online. Retrieved December 4, 2011. ^ "New 2013 Texas Tech Football Uniforms". Under Armour. Retrieved January 11, 2014. ^ "Property of Southwest Collection / Special Collections Library" (PDF). Retrieved December 4, 2011. ^ a b "Goin' Band From Raiderland » History". 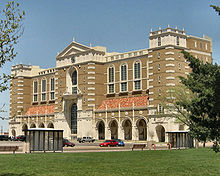 Orgs.ttu.edu. December 3, 1997. Retrieved December 4, 2011. ^ "The Sudler Trophy". John Philip Sousa Foundation. November 2007. Archived from the original on December 21, 2003. Retrieved August 14, 2008. ^ Wolfe, Angel (September 11, 2000). "Rider stands larger than life: A new statue dedicated to the history of the Masked Rider finds its home". Retrieved September 1, 2008. ^ "Raider Red". Texas Tech University. Retrieved August 30, 2008. ^ "Texas Tech Opponents". CFB Datawarehouse. Retrieved December 4, 2011. ^ Hartz, Marlena (December 14, 2008). "Texas Tech chancellor reclaims spurs from Texas". Lubbock Avalanche-Journal. Retrieved December 4, 2011. ^ "Raiderville". Texas Tech University. Retrieved October 25, 2013. ^ "AggieSports.com". AggieSports.com. September 30, 2003. Retrieved December 4, 2011. ^ "Texas Tech Game by Game against Opponents". CFB Datawarehouse. Retrieved December 4, 2011. ^ "2009 Media Supplement" (PDF). Texas Tech University. Retrieved December 30, 2009. ^ Brown, Chip (May 8, 1990). "Tough Schedule Concerns Dykes". Victoria Advocate. pp. 1B. Retrieved April 18, 2010. ^ "Leach Named FieldTurf/Howie Long Coach of the Year". College Football Hall of Fame. January 12, 2009. Retrieved August 20, 2010. ^ Williams, Don (January 5, 2019). "Matt Wells fills more positions on charter Tech staff". Lubbock Avalanche-Journal. Retrieved January 8, 2019. ^ Lopez, Shelby (January 2, 2019). "College Sports: Report: Texas Tech Hires Defensive Line Coach Paul Randolph from Memphis". Dallas Morning News. Retrieved January 3, 2019.